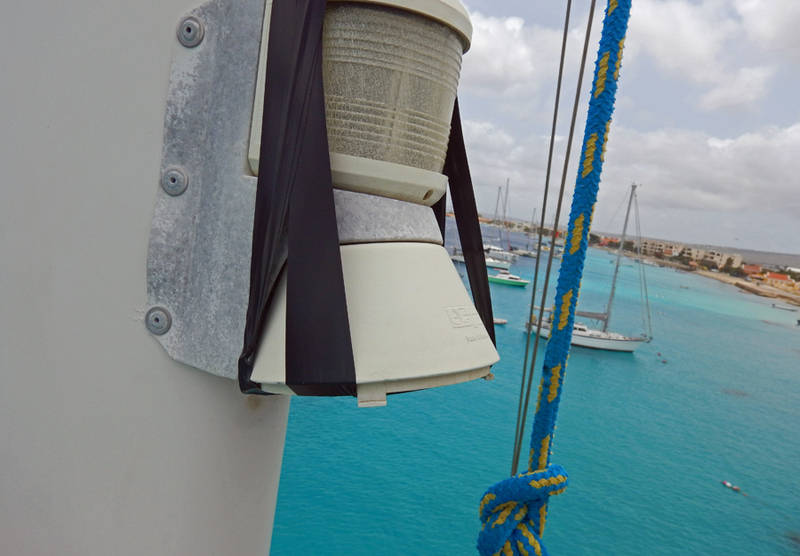 This broke during our recent trip and the bulb was hanging by a wire – a little tape to hold it until we can get a new one shipped – nice view from halfway up the mast. We loved being at Îles des Saintes but all good things come to an end. We reluctantly departed setting sail for Curacao, some 450 nautical miles away across the Caribbean Sea. We estimated the trip to take about 3 days and nights. We departed on a Tuesday and expected to arrive Friday morning. Little did we know at the time we would not be going to go to Curacao. When we awoke on Tuesday we looked at the latest weather. We saw the updated forecast now called for lighter winds than we hoped for at 10-15 knots and the wind direction had shifted more to the Northeast putting the wind right on our hinny. Sailboats prefer to have the wind more of an angle to the boat’s side. Tail winds will work but we do not get great speed. I almost said to Cindy we should wait for a few days and see if the winds pick up to a preferred 20-25 knot east or southeast. But, we have a reason for getting to Curacao on time. From there we will fly back to the USA for a few days and have already purchased airline tickets. We decided to go anyway since we were not sure what the future weather Gods had planned and needed to get south for the airplane trip. So how come we have a northeast wind and a sailboat is going southwest that both the wind and the boat are going the same direction. You would think the person who invented wind direction would have consulted with the guy who invented sailing to coordinate these things before putting on the labels ~ just saying. The same is true with currents. A north current and a south bound boat are both going the same direction. I tend to ponder these strange things when alone on watch with nothing to look at but the deep blue ocean. For the first day we traveled soooo sloooowly. I hate, absolutely hate, downwind light weather sailing. It gives the sensation of being motionless and making no headway. Even with the jib poled out, we only managed an average speed of a whopping 4 knots. Cindy was getting tired of me saying how much I hate downwind sailing. We didn’t even manage to clock off 100 miles in the first 24 hours. We had hoped for an average speed for the trip of about 6 knots. After a full day sailing, we could still barely make out the mountains of Guadeloupe in the rear view mirror, so disappointing. We hoped the wind would pick up. It didn’t. We spent day 2 with the same winds and realized the trip was now going to take us an extra day, or two. We were now over 100 miles behind where we had planned to be. Not only would we not arrive Friday morning but we would do well to arrive by Saturday afternoon. We did not want to start the engine, we wanted to sail. So we stuck it out. We had time built into the schedule. All will be good. When on a boat, a person needs to be careful about what they wish for. We wished for wind. You would think we are smarter than this. Ha! On day three the winds started to howl through the rigging and the forecast now showed increasing winds on Friday and more so on Saturday. Rather than wish for less wind and the possibility of being becalmed in the ocean for days on end, we decided to enjoy the ride. The wind also shifted a little to the east making Cream Puff very happy about the southwest heading direction. We reduced the sail area (reefing) to lessen the strain on our rigging. This also helps keep us a little more upright. We raced along a comfortable 7-8 knots. To get to Curacao on Friday meant Cream Puff would have to go all out the next 48 hours. We don’t like to sail on the very limits of life and death. This is not the America’s Cup race. It is about having fun and being comfortable. I awoke from a nap on day 3 to relieve Cindy from Watch. The winds had picked up more and she was ready to turn over the helm to get some well deserved sleep. I put the kettle on to make some tea. We have about a three year supply of Taylors of Harrogate English Breakfast Loose-leaf Tea aboard at all times. Some sailors opt for rum. This sailor likes his morning tea. I sat in the cockpit looking at the early morning sun enjoying a nice cuppa. It was so windy that my tea had waves in it. I’m not kidding about this. The wind created little white-cap waves in my teacup. Hmm, I think it’s windy enough now, thank you wind Gods. We use our satellite phone to get weather forecasts while underway. It’s connected to our ship’s computer and is sort of like a dial-up modem from the 1980’s, but much slower. It takes about 5 minutes to download a 5-day weather forecast to our navigation software. Clarity had set in after the morning head fog as a result of the magical Taylors of Harrogate English Breakfast Tea. I decide to look at our situation and determine when we would arrive in Curacao. We were looking at an arrival in Curacao at about 1 am Saturday. I am normally okay with night landings but we planned to anchor Cream Puff in Spanish Waters which meant navigating a narrow channel at night into a bay. This was something I found increasingly unappealing the more I thought about it. I looked at our options and decided to hit Cindy with a change of plan once she awoke. About four hours after dropping dead into a bunk, Cindy’s bright smiling face came up the companionway. I gave her a few minutes to wake up. She hasn’t discovered the magic of Taylors of Harrogate English Breakfast Tea. How do you feel about going to Bonaire instead of Curacao for a few days, I asked? I explained we could make Bonaire by Friday afternoon, in daylight. We have enough time built into our schedule to allow for a 7-9 day stay in Bonaire before continuing the 50 miles to the neighboring island of Curacao and we could still make our flights with no problem. If we continued to Curacao now, we were facing a nighttime landing, we would have to slow the boat and winds were due to increase to a point where it was going to get uncomfortable. Cindy didn’t hesitate, Bonaire sounds nice let’s go there. We changed course. There was a bit of a gamble to our decision to go to Bonaire for a planned arrival on late Friday afternoon. There is no anchoring allowed anywhere around the island. The entire island is a Marine Park and is a known superlative destination for SCUBA divers from all around the world. There is one marina and forty mooring buoys. The buoys are on a first come first serve basis. 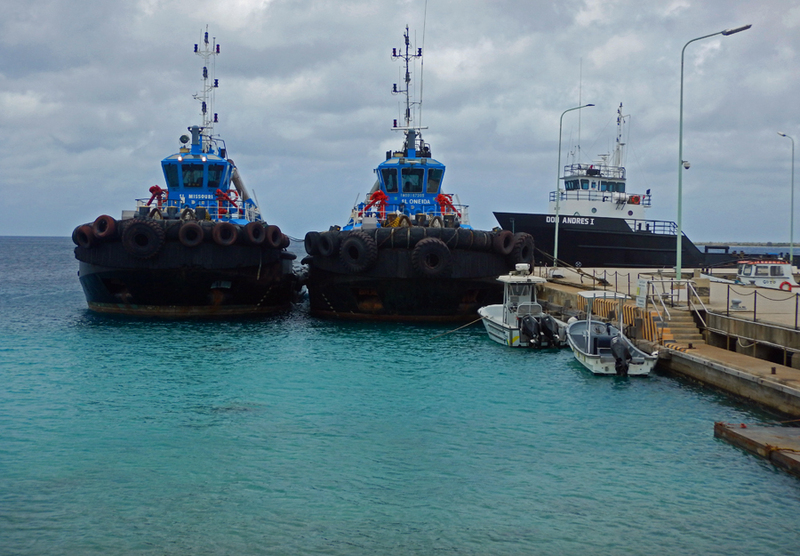 If we arrived to find the buoys full and no space in the small marina, we would be forced to sail on to Curacao. This would not be so bad because it would be an overnight and we would arrive in the day on Saturday due to our lengthy detour. But, we were really hoping to stop in Bonaire. When we awoke Friday and knew this was the day we’d see land and when we could park in a calm bay for a few days. This became a must-do. 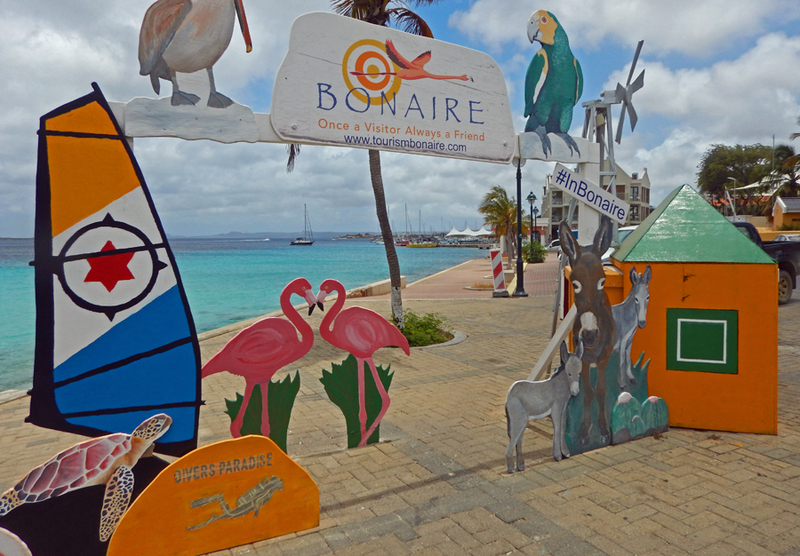 Our new mindset: Bonaire or bust. We arrived in Bonaire on Friday afternoon and rounded the southern tip of the island before heading into the bay on the leeward side. Through the binoculars, I started to count boats in the area I figured was the mooring field. I could see an awful lot of boats. Was it forty? Is the mooring field full? Do we have to keep going? Darn it, I sure hope not. We got a little closer. Still, no sign of an open mooring. We could now determine the moorings were red and white buoys. I was sure I was looking in the right area. But, none were open. Then, Karma kicked in. I spotted a buoy. It was red and white. And, no boat was attached to it. I glanced over my shoulder to see if a high-speed powerboat was going to beat us there, nope. I scanned the horizon in the opposite direction to see if another boat was approaching from the west, nope. I think we are in luck. It turned out there was only one buoy left and it was ours. Cindy hooked it on the first try and we secured Cream Puff. Apparently, it is a holiday weekend on Bonaire, who knew?! 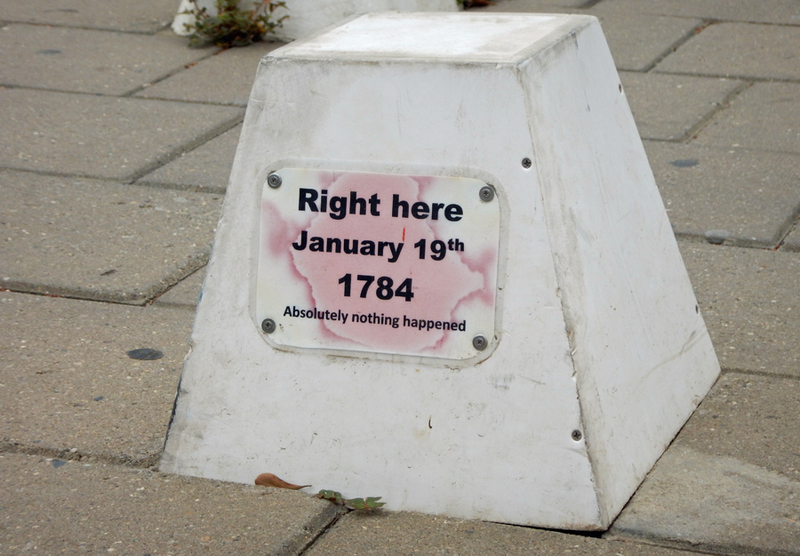 We think it is the king’s birthday. Many boats had planned to be here for the festivities filling up the slots. The marina is full, and now, so are the moorings. Friend: I thought you were going to Curacao? Us: Yes, we are there. Friend: We show Cream Puff in Bonaire. Us: These darn islands look all the same. But, we’re pretty sure we we’re in Curacao.